OptinMonster is a well-known and popular lead generation tool. This powerful and feature-rich solution will enable you to capture leads, grow your revenue, and boost conversions. But OptinMonster isn’t a cheap product. So is it worth the price tag? OptinMonster has been around since 2013 and, always top of its game in the lead generation field, it is now used on over 700,000 websites. Over time, OptinMonster developed from being solely a WordPress plugin to a fully hosted SaaS solution, making it now available to use on any website. 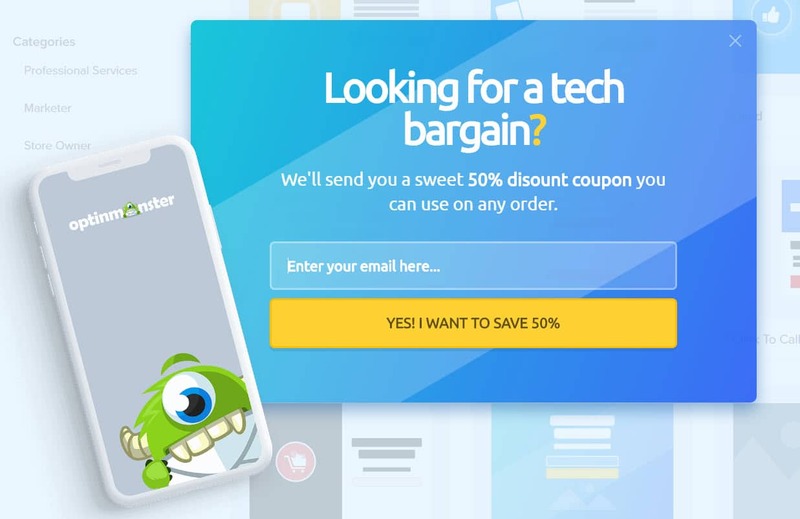 Boasting a wide assortment of features, OptinMonster has an impressive track record when it comes to conversion optimization and lead generation. Beautiful Highly-Optimized Lead Capture Forms – Choose from over 75 customizable pre-made templates. Multiple Form Types – Select from pop-ups, floating bars, slide-ins, full-screen overlays, and more. All in One User-Friendly Interface – OptinMonster provides a stand-alone, purpose-built dashboard, which boasts an extremely intuitive interface. Here you can create opt-in forms and campaigns, configure the settings, and access any of the tools and features OptinMonster provides. Drag-and-Drop Builder – Customize templates using the drag-and-drop builder, which allows you to make and view changes in real-time. Targeting and Personalization – Use precision targeting to show personalized campaigns to visitors on your site, based on their behavior and interaction with your content. Triggers – Use smart triggers to display the right campaign to the right person at the right time. These include scheduled and timed campaigns, scroll triggers, inactivity sensors, and much more. Exit Intent Technology – Capture leads before your visitors leave your site. eCommerce – OptinMonster works out of the box with all major eCommerce platforms, including WooCommerce, Shopify, Squarespace, Magento, BigCommerce, and many more. Reduce cart abandonment, display discount coupons, and increase sales with extensive eCommerce tools and features. 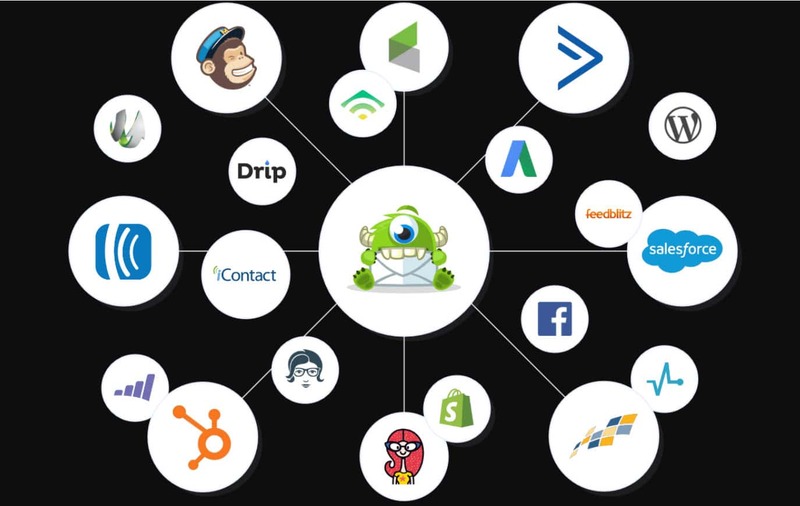 Seamless Integration with Email Marketing Services – OptinMonster’s software integrates with all major email marketing services including MailChimp, AWeber, ConvertKit, Infusionsoft, HubSpot, and many more. A/B Testing – Test headlines, content, and layouts to find out what designs appeal to your visitors and ensure maximum conversions. Analytics and Insights – Monitor your data to help you understand what is working and what needs improving. OptinMonster App – OptinMonster is a SaaS (software as a service) that caters for the needs of any HTML website (WordPress, Drupal, WordPress, and many more). WordPress Plugin – Websites can be easily integrated with the OptinMonster service via the Popups by OptinMonster WordPress plugin. Support – OptinMonster offers impressive support including a detailed knowledge base, a support ticket system, and live chat. As you can see, OptinMonster’s advanced and extensive list of features makes this platform a great choice for any business looking to grow their email list and help their website achieve its goals. So whether you are running a blog, an eCommerce store, a marketing agency, or another type of website, OptinMonster can help increase your conversions. Lightbox Popup – Grab users attention by displaying an opt-in form within a lightbox popup. Floating Bar – Add a floating opt-in bar a the top or bottom of the page that stays continuously on display, even as a user scrolls down or up the page. Inline Forms – Embed a form within a page’s content or in a blog post. Sidebar Forms – Display stylish opt-in forms in your sidebars. Content Locker – Lock your content and then grant access to users who part with their email address. Fullscreen Welcome Mat – Create a welcome message, share announcements, or add a call-to-action on a full-screen overlay that can’t be ignored. Slide-In Scroll Box – A more discrete campaign type, this pop-up slides into the corner of a user’s screen. Countdown Timer – Help give your sales and conversions a boost by giving your visitors a deadline on sales and promotions. Coupon Wheel Options – Create an interactive spin-a-wheel campaign to make an impact and increase sales. OptinMonster provides over 75 premade templates, catering for all campaign types. These templates can all be customized within the drag-and-drop builder (discussed next). There is also a selection of purpose-built mobile templates to select from, ensuring that your site’s pop-ups look great whatever device they are displayed on. If you would rather create a form from scratch, then you can opt to use OptinMonster’s Canvas tool. This provides you with a blank canvas, enabling you to build unique opt-in forms. Increase engagement with a quiz, contest, or raffle inside a popup. Grab users’ attention with a video or game embedded within a popup. Increase social follows with a Facebook ‘Like’ box or Twitter follow box popup. Keep visitors on your site for longer by sharing a related post pop up. Gather all the information you need from potential clients by displaying a multiple field contact from within a popup. 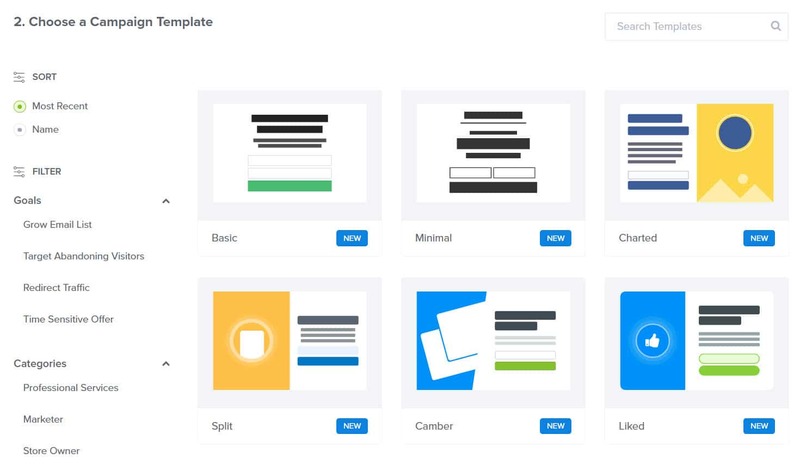 Templates, and blank canvases are built using OptinMonster’s impressive drag-and-drop builder. Extremely user-friendly, you can quickly customize your template, ensuring it matches the style and branding of your website. Alter the text, colors, background, and images, as well as the positioning and size of design elements by simply using the purpose-built drag-and-drop tools. You can also select from 26+ Monster Effects animations and sound effects to help ensure campaign visibility. Scroll Trigger – Select to show your visitors a pop-up after they have scrolled down a specific percentage of a page. 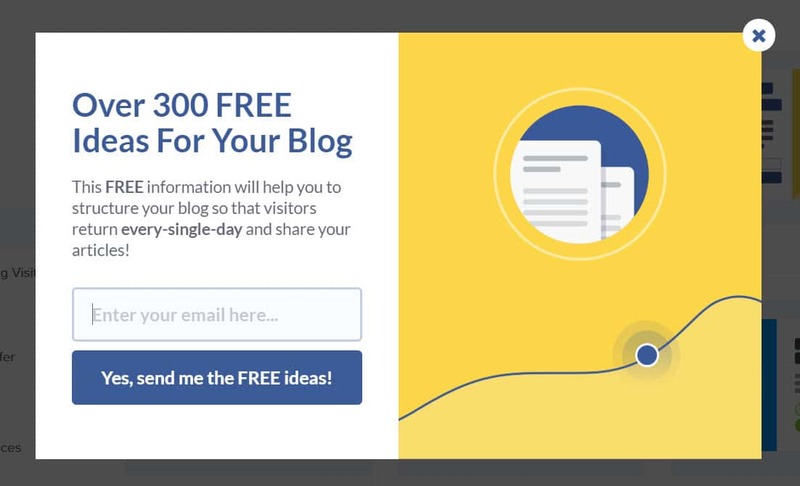 Exit Intent – Recover visitors who are just about to leave your site and then turn them into subscribers with exit intent pop-ups. Timed Display Control – Set time-triggered pop-ups to display after a certain time lapse, ensuring your opt-in forms are viewed at the optimal moment to boost conversions. Inactivity Sensor – OptinMonster detects inactivity on your site and targets these users with a pop-up to encourage them to re-engage with your content. Monster Links Two Step Options – Turn any link, button, or image into a two-step opt-in campaign. Campaign Scheduling – Run time-sensitive campaigns by setting pop-ups to display on certain dates, or during a specific time period. OptinMonster uses precision targeting which enables you to show personalized campaigns to specific groups of people. By showing pop-ups relevant to individuals, you are more likely to engage with your users and see conversions. Geo-Location Targeting – Personalize a visitor’s experience on your site by displaying opt-in forms based on their location. Page Level Targeting – Display campaigns relevant to the page or post a user is reading. Referrer Detection – Create specific marketing campaigns for users coming from different sources. On-Site Retargeting – Instead of showing returning visitors the same campaigns as new visitors, which can be frustrating especially if users have already subscribed to your mailing list, use the on-site retargeting tool to target repeat visitors with new promotions and offers. On-Site Follow Up Campaigns – Smart technology tracks how visitors interact with your content and other offers on your site. Targeted follow-up campaigns, designed to encourage specific visitors to take action, can then help turn uncommitted visitors into leads and customers. Device Based Targeting – Provide a cross-device seamless user-experience by creating separate campaigns, formatted for mobiles, tablets, and desktops respectively. Cookie Remarketing – Use cookie retargeting technology to personalize your pop-ups and display them to individuals based on their previous actions. Cookie data can identify where users are in your sales funnel, and then show content accordingly. For example, display upsells to someone who is just about to make a purchase, or related posts to a reader just finishing a blog post. Lead Sharing – Simplify your workflow and improve collaboration by integrating with external marketing tools and products and sharing leads across these services. List Segmentation – Group subscribers in your mailing list to enable you to personalize pop-ups, display campaigns that are relevant to individuals, and send emails that will engage. Smart Tags – Add tags to users on your mailing list, enabling you to personalize your campaigns and display dynamic smart content in your pop-ups. A/B Testing – OptinMonster has a built-in A/B testing tool, allowing you to easily split test campaigns with just a click of a button. Create split tests to help you analyze headlines, text, layouts, images, campaign triggers, and much more. You can then make data-driven decisions as to which campaign designs are displayed where, when, and to who. Conversion Analytics – Get statistics that matter to your business with the Conversion Analytics tool. Monitor clicks, views and overall conversions for each of your campaigns, find out what pages and content are driving opt-ins, and learn which specific devices and web browsers are driving results. This break down of your site’s analytics will help inform future campaigns, as well as enable you to tweak existing pop-ups and settings to ensure success. By providing you with the stats that matter, you can refine your lead generation strategy, increase revenue and boost conversions across your site. 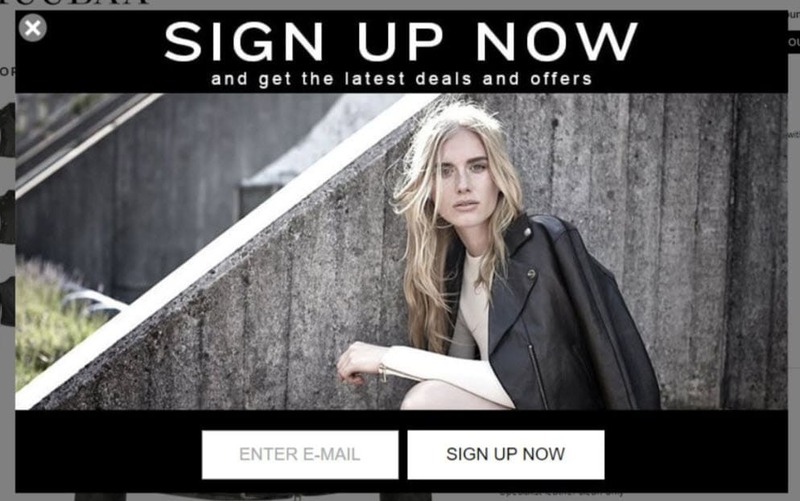 Increase Sales – Smart targeting features enable you to display pop-ups relevant to your visitors. By sharing promotions and deals on your site, you can push sales and increase the revenue produced from your existing site. Reduce Cart Abandonment – OptinMonster displays offers and discounts based on a users behavior on your site as well as time-sensitive data. By displaying a pop-up at the optimal time, users are more likely to complete the checkout process, and not leave products abandoned in the shopping cart. Convert Returning Visitors into Lifelong Customers – Smart technology identifies existing customers or returning visitors, and targets them with relevant follow-up campaigns. By displaying personalized campaigns to individuals, based on products they have previously bought or viewed, you can not just boost sales, but help to turn these sporadic visitors into loyal lifelong customers. By reducing cart abandonment and improving sales conversions, OptinMonster will help you unlock the maximum revenue from each of your website visitors. Knowledge Base – OptinMonster’s extensive knowledgebase is packed full of useful articles and videos. A ‘Get Started’ section also helps with the initial onboarding process, enabling users to quickly set up and publish pop-ups on their websites. YouTube – OptinMonster regularly posts how-to videos, case studies, and other inspirational material on its YouTube Channel to help users get the most out of their lead generation tool. Facebook – The OptinMonster Facebook page shares the latest posts from the OptinMonster blog, up-to-date news and announcements, and top tips and helpful advice on using the many features and tools on offer. Live Chat – You can speak directly to a member of the support team via the live chat feature. Support Ticket System – For technical support, you can submit a support ticket, which will be answered by one of the OptinMonster customer success specialists. Evidently, OptinMonster wants its users to get the most out of the platform, hence the numerous support options and channels available. OptinMonster provides an extremely smooth and intuitive user experience. All pop-ups, integrations, and settings are configured within the OptinMonster dashboard, and there are numerous help features along the way to ensure you understand the campaign creation process and get the most out of the many tools on offer. To get started, you will need to purchase one of OptinMonster’s packages (prices and packages are discussed further on in this article). Simply enter some basic contact details and your credit card details. Your account will then be immediately set up. 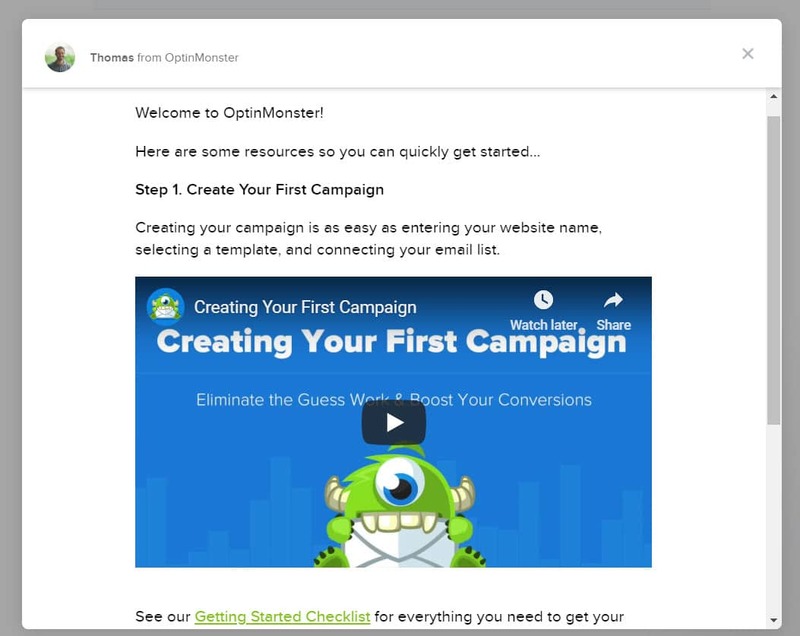 On registration, OptinMonster displays a friendly welcome letter, as well as an extremely useful ‘Creating your First Campaign’ video. You will now be invited to Create a New Campaign. You now need to choose the appropriate template for your campaign. These templates can be filtered based on goals and/or industry types. You can click directly on a template and select Preview to view each template in real-size and get an idea of how it will look on your website. Once you are have made a decision on the right template for you, select Use Template. Now give your campaign a name and add the site domain of the website that you would like to display the popup on. Then select Start Building. To edit the content of your template, simply click on the text element in the builder. You can then re-write the text in the editor on the left-hand menu of your screen. Here you can also alter font type and size, line height, letter spacing, and much more. By selecting Block at the top of the editor, you can edit the text block. Options include changing the text block background color, adding a box shadow, and displaying a border, to name a few options. To edit your form fields, within the drag-and-drop builder click directly into a field on your template. You can then add further fields, including Name, Phone Number, and a Privacy setting. You can also alter the text, configure the font settings, change the background colors, and more. In the button settings, you can also activate Conversion Tracking for your forms. To add a block to your popup, simply drag and drop the appropriate element onto your template. Under Display Settings, you can modify the Cookie Duration for your popup. This is the length of time between showing the campaign to a site-visitor, and when it is re-shown to the same visitor. If you display your campaign every time a visitor arrives at your site, they may quickly get frustrated with this bombardment of popups. Therefore, setting a custom cookie duration of around 15 days can ensure that your popups don’t affect user experience. Once you have finished customizing the appearance of your popup, you now need to configure the Display Rules (found in the top menu bar). 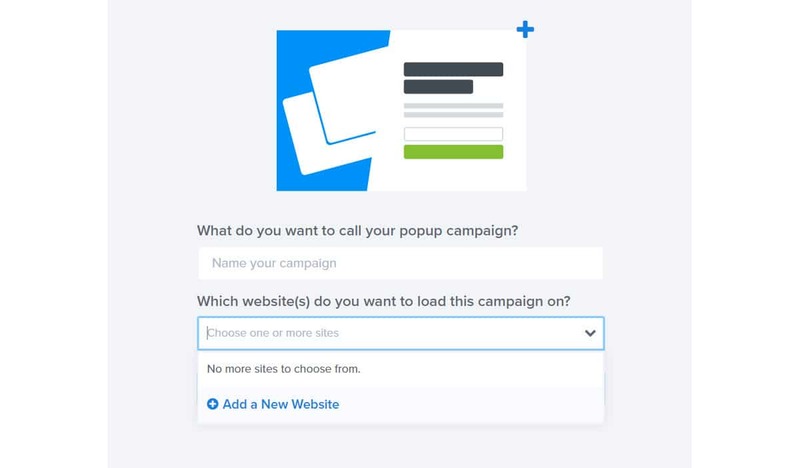 These display rules will determine who sees your popup campaign as well as when and where. Smart Triggers – Select when a campaign is shown to your users. This could be after a set time period, after a user scrolls a certain distance down a page, or if a visitor is inactive for a certain period of time, to name a few options. Behaviour Personalization – Select to display campaigns to visitors viewing specific pages of your site, or based on the device they are using, a URL path they have taken, or other targeted option. For each option there is extensive support material, helping you select the right display rules for your project. The next step of the OptinMonster campaign creation process is to set up your integrations. To do so, click Integrations > Add New Integrations from the menu at the top of the page. You can now scroll down through the list of integration services, and select your email marketing provider. You will then need to enter the appropriate information to successfully connect your accounts. Again, OptinMonster provides detailed support documentation for each email marketing service to help to guide you through this process. The last step before publishing your popup is to connect your OptinMonster account with Google Analytics. To do this, click on Analytics from the top menu. Then next to Google Analytics, select Connect. OptinMonster will now need to authenticate your Google Analytics account before it can enable analytics tracking for your campaign. To do so, click on Generate Authentication Code and then login with Google. 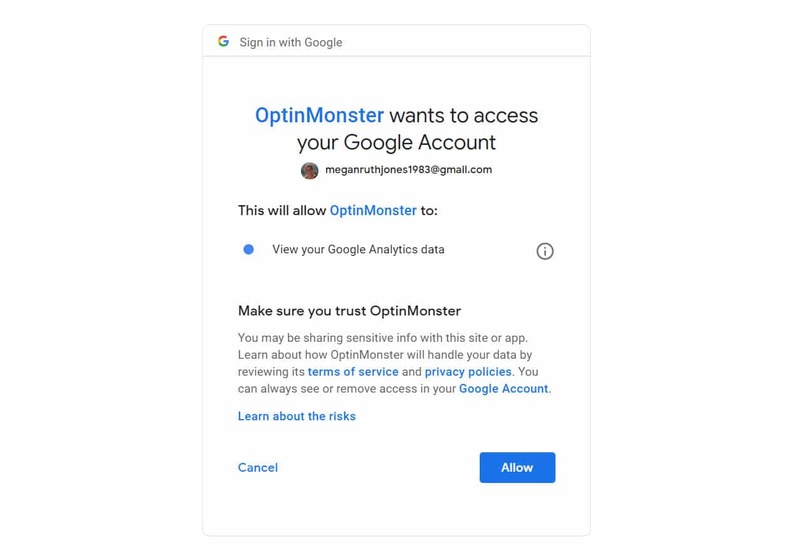 Google will ask you to Allow OptinMonster to view your Google Analytics data. Google will then provide a code that you need to copy and paste back into the OptinMonster Analytics page. Select Next and then wait for OptinMonster to integrate the accounts. Your campaign should now be finished and ready to go live. If you are adding your pop-up to a WordPress website, you will first need to publish your campaign within your OptinMonster dashboard, as well as enabling your campaign on your WordPress website (which we will look at next). To publish your campaign within your OptinMonster dashboard, simply select Publish from the top menu, and then toggle the button next to Status to Live. If you want to alter the website your campaign appears on you can also make this change here. Remember to select Save from the top menu before exiting the page. To display the popup on your website, you will now need to install the OptinMonster plugin and activate your campaign. To do so, open your WordPress website and select Plugins > Add New. Then, in the search function, type in Popups by OptinMonster. Once displayed, select Install Now > Activate. You will now find an OptinMonster menu has been added to your WordPress dashboard. Select Connect your Account. You will then be asked for your OptinMonster API credentials to enable your WordPress website to connect with your OptinMonster account. To find your API key, toggle back to your OptinMonster account. If you haven’t already, exit out of the drag-and-drop builder, and then select My Account > API from the menu bar. Select Create New Key and then give your key a name. Your new key will now be created. Copy the key and then paste it in the appropriate area within your WordPress dashboard. Now click on Connect to OptinMonster to sync your accounts. You will find a Campaigns tab has now been added to your WordPress dashboard. Select Refresh Campaigns. Your campaign should now be visible, and all that is left is to click on Go Live. Make sure you check out your popup on your live site and enter an email address to ensure it is working correctly. If you want to alter the design or settings at any point, simply log in to your OptinMonster dashboard to make the necessary changes. Evidently, OptinMonster provides an impressive user experience and a smooth and seamless campaign creation process. But before we complete this OptinMonster review, let’s check out the pricing plans this platform provides. When signing up with OptinMonster, there are four packages to select from. The plan you choose will very much depend on the features you need for your website, as well as the size of your audience, the number of site’s you want to use OptinMonster on, and of course, your budget. All plans are fully protected by a guaranteed 100% 14-day refund, if you decide that OptinMonster isn’t the right product for you. Price: $9 a month (billed annually). Price: $19 a month (billed annually). Price: $29 a month (billed annually). Price: $49 a month (billed annually). Evidently, OptinMonster is an impressive product, bursting with features to enable you to generate leads, push sales, and ensure your site converts against its goals. Although expensive, its combination of tools and features, alongside its ease of use, makes OptinMonster well worth the price tag. And by tracking your conversions, you will quickly see if your campaigns are generating enough revenue to justify the outgoings of this platform. So are you ready to sign up with OptinMonster?